Eunice Burns (MPA '70) holds up a photograph taken at her 90th birthday celebration. It's of her children—Catherine's the oldest; then there's Laurie, Robert, and Tamara. In the picture Burns beams with pride, as she does now. Over the years, Burns' children have organized small tributes on her birthday to honor her lifetime of dedication to the city of Ann Arbor; on a number of occasions she has received proclamations from the mayor. This year they held to that tradition but they also established the Eunice Burns Fund for Water Policy Education at the Ford School (previously the Institute of Public Policy Studies, or IPPS), from which she graduated in 1970. For 52 years Burns has played many roles in Ann Arbor civic life—including three terms as a member of City Council—and for most of that time she has also served on the board of the Huron River Watershed Council (HRWC). In 1981, she co-founded Huron River Day, an annual preservation event emphasizing the importance of water quality. The gift to the Ford School is a fitting tribute to this farm girl and former physical education teacher who was born and raised in southern Minnesota, "15 miles as the crow flies from the Mississippi" as she says. Who could have predicted that she would become a powerful voice in Ann Arbor political life and a passionate advocate of civic engagement? Certainly not Burns. In 1961, Burns' husband, microbiologist and U-M professor Charles Burns, encouraged her to step up to a new challenge: run for a vacant City Council seat. "But I can't," she told him, "I don't even like speaking in front of groups." "What do you believe in? What would you like to accomplish?" "I'd like to pass the Fair Housing Ordinance," she said. "I campaigned and did the whole thing. I was scared to death the first time I went out to meet people, but I went to every door in the ward. The first person I met didn't speak English; I spent 15 minutes trying to talk to her," Burns recalls, laughing. "Usually, I would just hand out my literature and say, 'unless you have any questions, I'll just keep going.'" Burns continues, "But then I kind of liked it; it was fun. So I went to all those doors, and I won." She thought to herself, now what am I going to do? The first part of the Ann Arbor Fair Housing Ordinance passed in 1963; the full ordinance passed during Burns' second term in September of 1965. It was the first such statute in Michigan. "I discovered that I knew more than a lot of the men on that council because, even though I had four children, I studied and learned," she says. In 1965, the untimely death of Charles Burns in a sailboat accident put Eunice Burns' resolve to the test. "I had four children, so I needed to go on," she recalls. After the City Council, Burns worked on her Master of Public Policy degree. She secured course credits for prior experience from Pat Crecine, then chair of IPPS. "I walk in the door, and he says, 'Oh, I see you've been on City Council; I think you ought to have 6 credits.' One credit for each year," she says chuckling. Master's degree in hand, Burns didn't feel particularly savvy about the job search. "I just went to my friends and said, 'Hey, I'm available!'" It worked. Burns assisted Wilbur Cohen, former dean of the School of Education. For part of that time, she also worked directly for President Robben Fleming as the chair of the U-M Commission for Women. She authored the Burns Report on women in intercollegiate athletics, which recommended actions to implement Title IX in the wake of its passage in 1972. After a decade of service to the University, Burns retired in 1982. Among Burns' many roles, she continues to sit on the board of the HRWC, which recently honored her with the inaugural Herb Munzel Lifetime Achievement Award. "Eunice Burns' leadership and commitment to the development of citizen science and stewardship has helped foster the effectiveness of HRWC," says executive director Laura Rubin. "She has made a significant difference in improving the water quality and the quality of life in Ann Arbor." 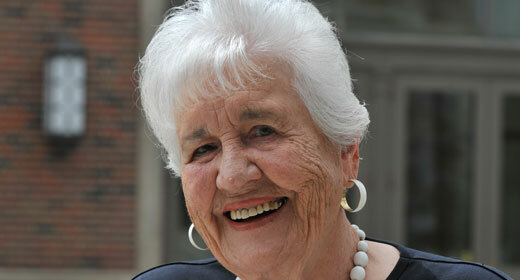 On Burns' 90th birthday, Ann Arbor mayor John Hieftje proclaimed her the "Yes, You!" Torch Bearer for a lifetime of service. Looking back on an unexpected but influential career, she advises young women to "find out what's going on and get involved with some part of it—you can start just licking envelopes. I remember the first door I knocked on when I was campaigning, and it got easier and easier after that. You just have to take the first step and see where it leads you. And at age 90, I still haven't stopped!" Launched with a $35,000 gift, the Eunice Burns Fund for Water Policy Education will support educational and research activities at the Center for Local, State and Urban Policy (CLOSUP). The fund will enable students, scholars, and the public to better understand the policy implications around sustainable methods of managing the world's supply of fresh water, and related issues associated with effective environmental governance. The gift to the Ford School is also a gift to Eunice Burns from her children as a way to honor her steadfast commitment to her family, the U-M, Ann Arbor, and the environment. "The four of us started talking about it, and everyone was very enthusiastic," says Burns' daughter Laurie Burns McRobbie. "We also needed to do this in a way that would allow her to interact with the students who benefit from the fund. I think, more than anything, what she exemplifies is the notion that everybody has the ability to step up and make a difference." Below is a formatted version of this article from State & Hill, the magazine of the Ford School. View the entire Fall 2013 State & Hill here.